71. The Oriental Circlet and the Crown Rubies: Inspired by Indian motifs he viewed at the Great Exhibition, Prince Albert designed this diamond circlet for Queen Victoria in 1853. The piece was originally studded with opals, and Albert purchased a coordinating suite of opal jewelry to go with the circlet the following year. When the British lost the Hanoverian claim, the circlet had to be remade with new diamonds; in the early 20th century, the entire suite was renovated again when Queen Alexandra had the opals replaced with rubies. The set was designated by Queen Victoria as an heirloom of the crown, and it accordingly passed from Alexandra to Queen Mary to the Queen Mother. However, when George VI died, the Queen Mum retained the suite. The Queen finally inherited the tiara and the accompanying ruby suite from her mother in 2002; since then she has worn the tiara once (paired with the Baring Ruby Necklace) and the rubies occasionally. 72. Queen Victoria's Fringe Brooch: This elaborate diamond brooch, which is also sometimes called a "waterfall" brooch, was probably made using jewels that Queen Victoria had received from the Sultan of Turkey in 1856. The piece has been reworked occasionally over the years, and in 1901, Victoria decided to bequeath it personally to her eldest son, King Edward VII. Since then, the piece has been handed from Queen Alexandra to Queen Mary to the Queen Mother and then, in 2002, to the Queen. 73. Queen Victoria's Diamond Jubilee Brooch: Only two monarchs in British history have celebrated a Diamond Jubilee -- Queen Victoria in 1897 and Queen Elizabeth II in 2012. 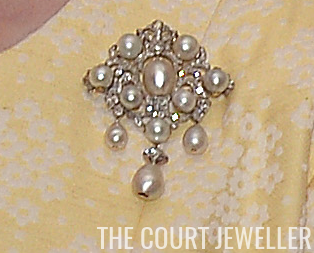 To mark Victoria's milestone, her Household presented her with this Garrard diamond and pearl brooch. 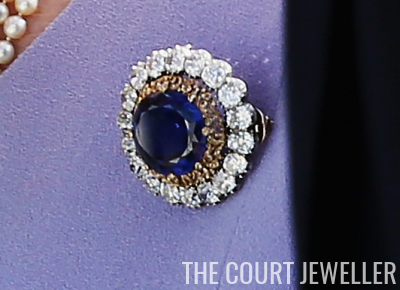 Victoria called the piece "beautiful" and designated it an heirloom of the crown. It subsequently passed to each queen consort, but the Queen Mother held on to the piece until her death in 2002. Since then, the Queen has worn the brooch for both day and evening engagements. 74. Queen Mary's Fringe Tiara: The Queen first wore this diamond fringe tiara in 1947 on her wedding day, but back then it was just a loan. The tiara was made in 1919 for Queen Mary as a more modern, streamlined version of Queen Adelaide's more cumbersome diamond fringe; in 1936, she gave it to her daughter-in-law, Queen Elizabeth (the Queen Mother). She loaned it to her daughter (Queen Elizabeth II) and her granddaughter (Princess Anne) to wear at their weddings, and in 2002, she bequeathed the tiara to the Queen. Since then, the Queen has worn it occasionally for banquets and portraits. 75. 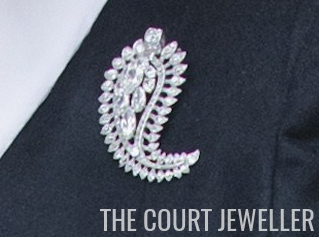 Queen Elizabeth's Palm Leaf Brooch: This diamond and platinum brooch was made for the Queen Mother by Cartier in 1938. It features a palm-leaf design, although many have noted the visual resemblance to a paisley pattern. The Queen Mum wore the brooch throughout her life, and since inheriting it in 2002, the Queen has also made it a regular part of her brooch rotation. 76. Queen Elizabeth's Maple Leaf Brooch: King George VI presented this brooch to his wife in 1939 in honor of their state visit to Canada that year. 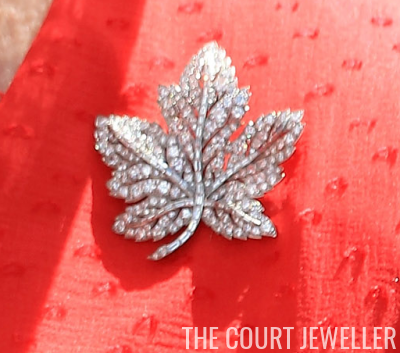 Made by Asprey, the diamond and platinum brooch is made in the shape of a familiar Canadian national symbol: the maple leaf. The Queen Mother owned the brooch until her death in 2002, but she lent the brooch to the Queen on at least one occasion when she was touring Canada. The Queen later extended the same gesture to her granddaughter-in-law, loaning the brooch to the Duchess of Cambridge for her first Canadian tour in 2011. 77. 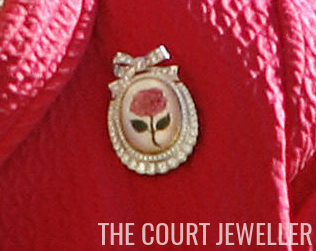 The Centenary Rose Brooch: This brooch is a particularly special part of the Queen Mother's bequest. In 2000, the Queen gave the rock crystal brooch, which features a hand-painted rose surrounded by diamonds, to her mother as a 100th birthday present. 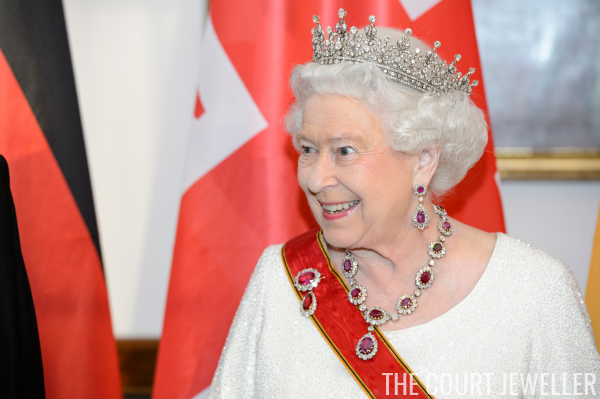 A little over a year later, the Queen Mother willed the brooch back to her daughter. The Queen has worn it often in the years since. 78. The Duchess of Teck's Flower Brooch: This diamond brooch extends at least three generations back in the Queen's family tree, and possibly even further. It belonged to her great-grandmother, the Duchess of Teck, who bequeathed it to her son, Adolphus. The brooch made its way somehow from Adolphus to his sister, Queen Mary; she presented it to her son, the future King George VI, as a gift for his new bride, Elizabeth. 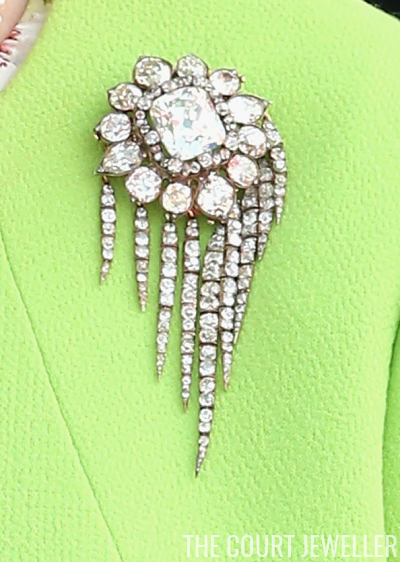 The Queen Mother absolutely loved this brooch and wore it until the very end of her very long life. In 2002, it was inherited by the Queen, who wore it in a 2010 portrait taken by Lord Snowdon. 79. The Romanov Sapphire Brooch: One of my absolute favorites of the Queen's brooches, this piece once belonged to Empress Marie Feodorovna of Russia, sister of Queen Alexandra and mother of the doomed last tsar. Queen Mary purchased the brooch from the late empress's estate in the 1930s and bequeathed it in 1953 to her daughter-in-law, the Queen Mother. The Queen inherited the gorgeous brooch, which features intricate gold work between the large sapphire and cluster of diamonds, in 2002. 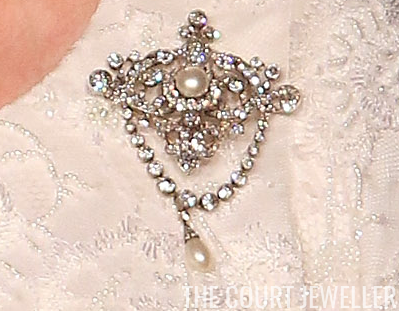 Her first public outing in the brooch came during a 2014 visit to the Vatican. 80. Queen Victoria's Pearl and Diamond Brooch: This intricate pearl and diamond brooch is another of the heirlooms of the crown that the Queen Mother retained after her husband's death. Set with eleven pearls, Victoria designated it an heirloom of the crown in 1901, and it passed through the line of queens consort to the Queen Mother, who loved the piece and kept it until her death in 2002. Recently it has appeared frequently on the Queen at daytime events.